you may be eligible for a PROVISIONAL (ie Temporary) Skilled - Nominated or Sponsored Visa, which enables you to live and work in Regional Australia for 3 years and to apply for a permanent Skilled Visa when you have lived there for 2 years and worked there full-time for 1 year. The key to this visa is the term "REGIONAL AUSTRALIA", which refers to the whole of Australia with the exception of Sydney, Newcastle, the Central Coast, Wollongong, the greater Brisbane area, the Gold Coast, the Melbourne metropolitan area and Perth and surrounding areas. Every State and Territory has a State Migration Plan, which contain a larger number of occupations than does the current SOL, though the number and kind of occupations in each of the Plans is somewhat different. When your nominated occupation is in a particular State Migration Plan and you score at least 60 points on the Points Test, you may be eligible for a Skilled - Nominated or Sponsored (Provisional) visa by being sponsored by that State or Territory. If you are so sponsored, you can claim an extra 10 points for your Points Test, so that you only need 50 points on the basic Points Test to become eligible. If your nominated occupation is on the Skilled Occupations List, but your Points Test score is less than 60 and you or your spouse have an eligible relative who lives in Regional Australia and who is willing to sponsor you, you can claim an extra 10 points for your Points Test, so that you only need 50 points on the basic Points Test to become eligible. 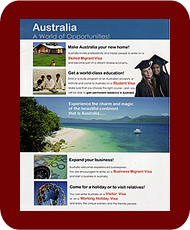 If you are successful in gaining the visa, you must live, work and study only in the Regional Area of Australia for which you have been sponsored. If you do, you can apply for a PERMANENT Skilled - Regional (Subclass 887) visa, after you have held the visa for two years. You also have the option of applying for a permanent visa at any time if you are supported by a regional employer in Regional Australia. The full requirements for the Skilled - Nominated or Sponsored (Provisional) Visa are that you have to be under 50 years of age and have adequate EnglishYou must prove this by providing the International English Language Testing System (IELTS) score required for your nominated occupation.. You will need to have formal professional qualifications in your nominated occupation.Your nominated occupation is the occupation for which you have a Skills Assessment. Whether you are, or are not, a professional in your nominated occupation is determined by the assessing body designated by Australia The State Migration Plans show which assessing body you need to approach for your particular occupation. to assess your skills and qualifications. you must have a skills assessment. The Skills Assessment creates some uncertainty: it is usually the first stage of the visa aplication process and as such the outcome cannot be predicted. In the vast majority of cases, however, as long as your application follows the rules and the supporting documentation is perfect, it is unlikely that your skills assessment will be negative. In the unlikely event that this should happen, most Assessment Authorities allow an application to be submitted more than once.